Dxgkrnl.sys error appears with blue Screen and restarts the system, this error occurs when dxgkrnl.sys file gets damaged or corrupt. In this blog, you will read about the complete solution over Dxgkrnl.sys blue screen of death error in Windows 10, apply the below-given methods to get rid of fix Dxgkrnl.sys error. However, in some cases, you will get dxgkrnl.sys blue screen errors just after you have installed new software or hardware. These errors can occur while installing a program related to system software. These are some other related causes of dxgkrnl.sys blue screen error. So, now in the below section, you will get to know about some manual solutions to fix this error with an ease. According to a report, this error generated because of an outdated system and drivers so that it is recommended to make sure that OS is packed with the latest update. Also, check that system’s drivers are updated, you can use a professional Driver updater tool to do this task because the manual method is little difficult. Step 1: Open Nvidia Control Panel. Double Click on ht the icon present in the bottom right corner. Step 2: Navigate to the 3D Settings and click on Set SLI Configuration. Step 3: Select Do Not Use SLI Technology. Step 4: Click on Apply to save changes. Nvidia Surround allows the user to enjoy 3D experience on multiple monitors. This is an amazing feature for gamers but in Windows 10 this feature generate blue screen of death error. Due to this feature user have to face System_Service_Exception dxgkrnl.sys BSoD error in Windows 10. So that, if you want to fix this issue then turn off Nvidia Surround. Use shortcut to turn it off, press CTRL+ALT+S or CTRL+ALT+R to turn it off. You can also set Nvidia Surround to off by simply unplugging other monitors and restarting system with only one monitor. Some user reported that by changing graphics memory size in BIOS this error can be fixed, in case of using integrated graphics you should change the graphics memory size in BIOS. Step 1: Open system’s BIOS, restart your computer and keep pressing Del, F2 or F10 on your keyboard (key may be different for different system). Step 2: After it, find Advanced, Advanced Chipset or Advanced Features menu. Step 3: Find Graphics Settings or Video Settings and change the memory size to 128MB or more. Note: Process of changing memory size for integrated graphic card isn’t the same for all computers. If you want to make your system fast and error free then you should use a professionally designed PC Repair Tool. This application is one of the best and efficient ways to maintain your Windows system. This software contains easy to use interface so that one can easily operate this tool without any need of professional skill. If your computer is displaying any types of error related to registry, DLL, application, Games and more then this error repair tool will help you to fix them. Simply download and install this tool, it will automatically scan your PC/laptop and fix all the errors. This app also provides the facility to fix driver related issue, it can update and fix any error related to the system’s driver. So, it is recommended to use this software and enhance the performance of your old computer. It is clear from the above sections of this blog that if you get dxgkrnl.sys blue screen error then you can try all the manual solutions stated above. So, try to perform the manual solutions one after another if it fails. Or, apart from these, you can also check the device drivers and then update them, scan the PC, delete temporary files and keep well-reputed antivirus tool in your Windows 10 system. Also, you can try PC Repair Tool if nothing works. 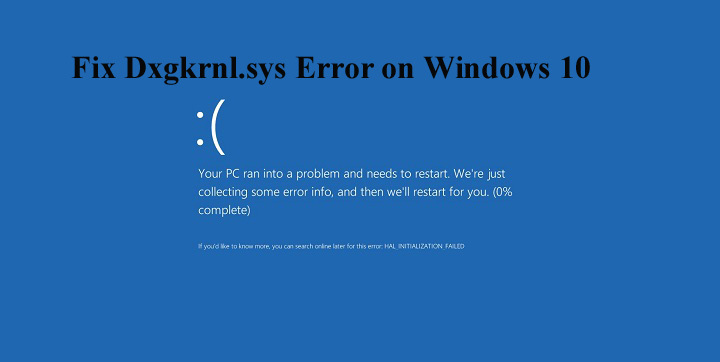 This tool has the capability to fix dxgkrnl.sys blue screen error related to your Windows PC. So, do not worry at all, just try all the solutions mentioned here. All the Best to you. If you get dxgkrnl.sys blue screen error while working on Windows 10 then do not panic, just try all the manual fixes to resolve dxgkrnl.sys blue screen error.